Hungariae descriptio, Wolfgango Lazio Auct - Ortelius, A. 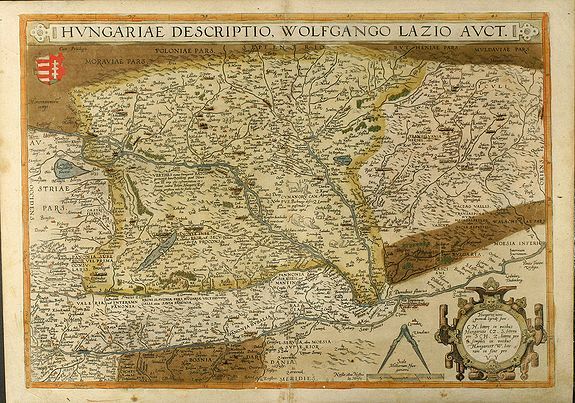 Title : Hungariae descriptio, Wolfgango Lazio Auct. Size : 13.9 x 19.6 inches. / 35.3 x 49.7 cm. Description :Original old colour copper engraved map of Hungary by A. Ortelius. The map is based on Wolfgang Lazius 5 sheet wall map of 1556. From the 1580 German edition of "Theatrum Orbis Terrarum". Condition : Completly backed with Japan paper, some place names underlined with old ink, some green oxidation occurs. Due to restoration the map is stable and in good condition.